Easily define renderers that calculate symbol size based on attribute values as well as map scale. Applies to polygon markers and polygon outline width. The createSizeRenderer method supports the following values for its optimizeForScale parameter. For example, map-scale or true indicates that the size range is optimized only for the current map scale. 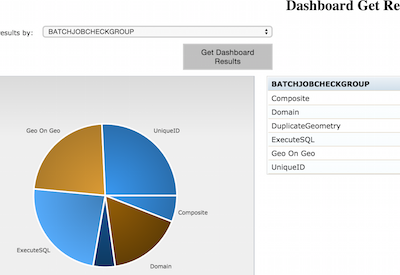 Next, visible-scale-range indicates that the range is optimized for all scales in the layer's visible scale range. Added support for sizeInfo.stops. Each stop has value and size properties. Added support for sizeInfo.minSize and sizeInfo.maxSize to be an actual SizeInfo object itself. What is the most predominant pet in an area? Dogs or cats? 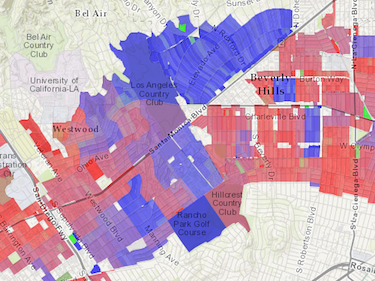 What is the most predominant type of household in a neighborhood? Owner-occupied or renter-occupied? Each attribute is assigned a unique color. The value of the color's opacity is calculated based on the value of that attribute for a given feature. Meaning the higher the attribute value, the more dominant the attribute becomes. The LayerList widget allows users to turn layers on and off. NOTE: This is currently in beta. 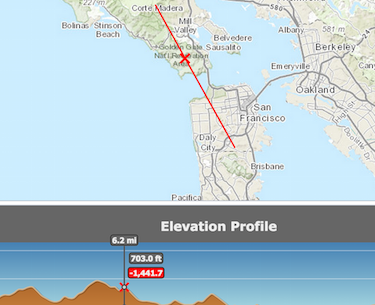 The Elevation profile widget allows users to view an elevation profile along a path. NOTE: This is currently in beta. 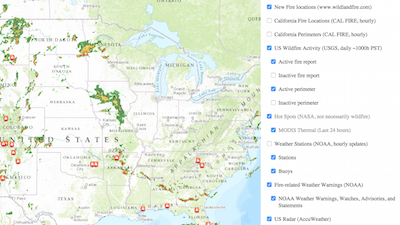 The Open Geospatial Consortium Web Feature Service Interface Standard (WFS) provides an interface allowing requests for geographical features across the web using platform-independent calls. For more information about the Web Feature Service, see the following Wikipedia article, and the OGC Web Feature Service home page. For more details, see the WFSLayer API Reference (beta at version 3.14) and the WFSLayer sample. 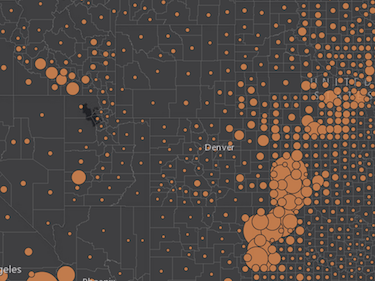 See the Working with DataReviewer help topic and the ArcGIS Resource Center to learn more about using ArcGIS Data Reviewer. The 3.14 Directions widget has been migrated to use the Search widget. In order to feed a custom geocoder/feature services into this widget, use the new searchOptions property. Prior to 3.14, the unit parameter in several GeometryEngine methods, such as buffer(), geodesicArea(), offset(), etc. required a number value from this list. While these numbers are still supported, all unit parameters in these methods can take string values (e.g. "miles", "meters", "square-feet", etc.) starting in version 3.14. This should make using and reading geometryEngine methods easier. See the documentation for more details. Starting with 3.14, the input arrays for geometries and buffer values in GeometryEngine.buffer() and GeometryEngine.geodesicBuffer() do not have to be the same length. Refer to the documentation for additional details. RasterLayer class is no longer in beta. Two new methods added to RasterLayer, setImageFormat and setUseMapTime. PixelBlock class is no longer in beta. A new OPERATION_SUM constant added to MosaicRule. A new ImageServiceMeasureTask class was added. A new ImageServiceMeasureParameters class was added. A new ImageServiceMeasureTool class was added. A new ImageServiceMeasure class was added. A new ImageSpatialReference class was added. A new beta ObliqueViewer widget was added. Version 3.14 adds support for Traditional Chinese (Taiwan) (language code "zh-tw"). Add the following line snippet to any code sample to see it in Traditional Chinese (Taiwan). Version 3.14 adds support for Traditional Chinese (Hong Kong) (language code "zh-hk"). Add the following line snippet to any code sample to see it in Traditional Chinese (Hong Kong). Editor widget has a public editToolbar property, providing access to the widget's Edit toolbar. Many of the bugs fixed in this release improve support for touch events in IE10/IE11. See the list below for a detailed look at these bug fixes. BUG-000086204: Fixed an IE10 and IE11 issue when editing vertices and snapping to line/polygon features didn't work correctly. BUG-000085838: Fixed an issue where polar projection coordinates displayed incorrectly when using the measurement widget. NIM094815: The mouse-drag event now works correctly using IE10 and IE11. NIM101882/BUG-000085005: Draw tools now creates the starting vertex point at the correct position using IE10 and IE11. BUG-000083753: Using IE10 or IE11, there is no longer an additional vertex added when creating a polyline or polygon. BUG-000086260: Fixed an issue where if two or more KML layers overlapped one another, the layers did not display correctly. BUG-000085097: Fixed an issue where searching for features would fail if the service used did not support pagination. NIM102402: Fixed an issue where if using a map image layer, it would change position when panning using specific mouse buttons. BUG-000087742: Fixed an issue where fields with coded value domains showed "required" even if the field was nullable. BUG-000087358: Fixed an issue where using cacheBust:true rendered SimpleFillSymbol incorrectly. BUG-000087174: Fixed an issue where it was not possible to create multiple KML layers. BUG-000087251: It is now possible to add and edit features using the Editor toolbar if the map contains a WMTS layer. BUG-000086146: Fixed an IE11 issue where tiles would not load while panning unless mouse button is released. BUG-000086150: Fixed an an issue specific to 3.13 where legends would fail if using JSON data. BUG-000085436: Fixed an issue where polyline vertexes were showing multiple endpoints when using IE11. BUG-000084867: Fixed an issue where using the Esc key would result in an "uncaught type error" while aborting a sketch. BUG-000084429: Fixed an issue where if using Chrome, the mouse would remain in Pan mode. BUG-000086624: Fixed an issue where clicking the edge of the map causes the InfoWindow to be displayed. BUG-000087378: Fixed an issue where a feature's geometry display was affected in the map viewer if the query request uses the quantization parameter. ENH-000084434: A default symbol value is now used in renderers if the normalization field value is zero. BUG-000086767: Fixed an issue where editing always applied attributes from the first edited feature on subsequent edits. NIM102567: Editors can now add attachments to hosted feature services. NIM099625: Fixed an issue where hidden maps became corrupt after map auto-resize. NIM091498: Fixed an issue where map disappeared when the view and orientation of iPad/iPhone and Android was changed. BUG-000087082: Fixed an issue where map with vertical scroll bar drew at a wrong position using 'Draw' toolbar when map is scrolled. BUG-000086784: Corrected API documentation to state that add() is not supported with FeatureLayer or LabelLayer classes. BUG-000087582: Fixed BasemapToggle documentation to reflect the correct object property names for basemaps property. BUG-000086608: Fixed broken sample to now work as described. Now includes options for put-selector, and xstyle packages in the user-interface. Updates to support locales Thai (th), Turkish (tr), Traditional Chinese (Taiwan) (zh-tw), Traditional Chinese (Hong Kong) (zh-hk).